Some of my friends don’t drink alcohol, so when deciding on a cocktail for the evening I always make something that is just as delicious with or without alcohol. In a pitcher mix 3/4 pomegranate lime juice with 1/4 seltzer. Add in a few slices of lime and a handful of pomegranate seeds to garnish. In a bowl, place a couple bottles of chilled wine and vodka for guests to add as they like. Have a separate container filled with ice off to the side. Awsome, so organized and simple.Love the Mac & Cheese idea!!! 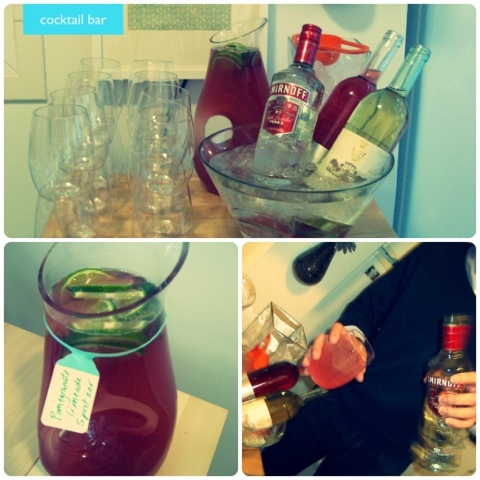 This drink was a HIT at my party!! Love hearing that! I have another great cocktail in the works coming later this week. Next Postice bucket? I don’t have an ice bucket!